On December 20, 2018, just before the holly Christmas with the mood of joy and sound of chorus, a surprising news stroke all the dermatological scientists: Dr. Stephen Katz suddenly passed away due to stroke. 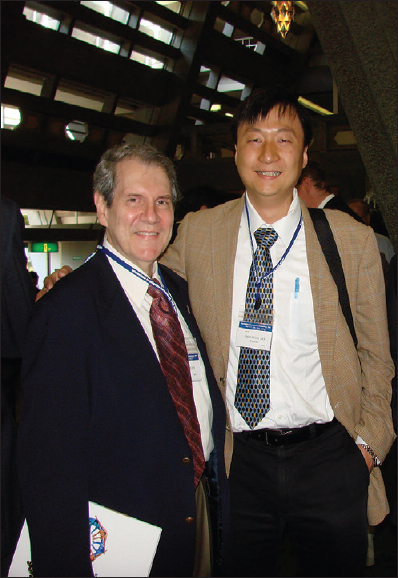 Back to the end of 2002 during the annual meeting of Taiwanese Dermatological Association (TDA), Prof. Hsin-Su Yu introduced me to Steve. He is a distinguished scientist, educator, voyager, statesman, and physician. He encouraged me to study abroad equipped with an everlasting passion. Thereafter, I served my visiting fellowship in the top US health research unit – the National Institutes of Health (NIH) in 2004. During my 3-year term of fellowship, Steve was one of the principle investigators in Dermatology Branch, CCR, NCI, NIH. Besides this PI role in Dermatology Branch, Steve was also the Director of the National Institute of Arthritis and Musculoskeletal and Skin Diseases. During the branch laboratory meetings, Steve usually gave instructive suggestions, guided the strategic directions, and pivoted the multidisciplinary and insightful viewpoints. Not only an internationally renowned and distinguished investigator, Steve also served as the NIAMS director for several decades. He upgraded the dermatology into a new level and deeply influenced the perspective and directions for the biomedical research societies. He is truly a legend of physician scientist in dermatology. As a pioneer in skin immunology to characterize the source and function of Langerhans cells, he led many fellows and physicians to step in for skin and immune research. Thanks to Steve's breakthrough research in Langerhans cell biology, skin was then recognized as a full functional organ of immune system. Skin immunology and skin science flourish in the context of good personal relationship and academic interactions among Prof. Yu in Taiwan, Prof. Katz in US, and Prof. Tamaki in Japan. Coupled with the development of monoclonal antibodies for cytokines and immune checkpoints in disease treatment, along with advance in hair biology and regenerative medicine, the skin science truly becomes a good example of interdisciplinary and translational science from patient care to bench research. Steve is a good educator and he has harvested many world-leading scholars in immune and skin research. With his dedicated guidance of faith and accountability, his fellows usually become passionate and equipped with comprehensive ability in academic research. As a master mentor for research and clinical fellows, Steve has successfully harvested many distinguished leaders in dermatological science in the 21 century worldwide, including those from US, Japan, Europe, Korea, and Taiwan. 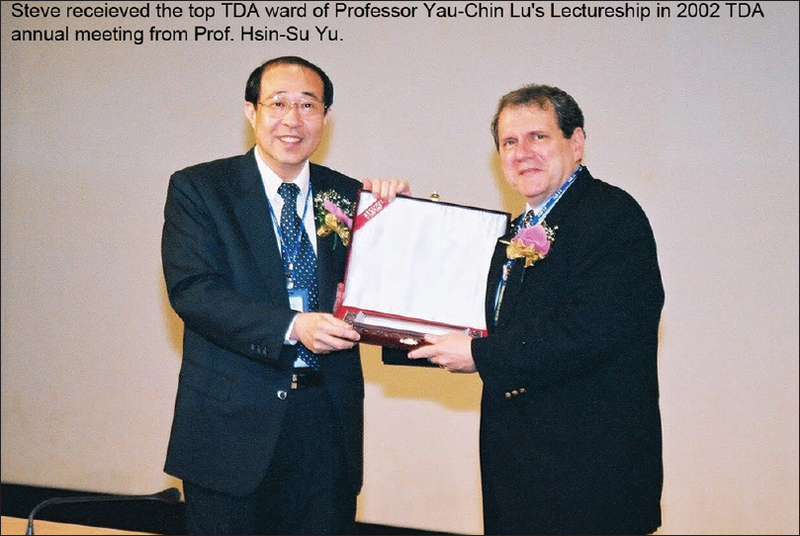 For his accomplishments in the science and education, TDA is very proud to host him in three annual meetings in 2002, 2009, and 2010, and to award him with the top TDA award of Professor Yau-Chin Lu's Lectureship in 2002 [Figure 1]. In Taiwan, five dermatologists interacted with him in Dermatology Branch of NIH, including Meng-Tse Wu, Roger CC Hsu, Li-Fang Wang, Kathy Chien-Hui Hong, and myself. The former two are in private practice and the latter three remain in the academic institution. Steve is also very friendly to Taiwan. He was the President of International League of Dermatological Societies (ILDS) from 1997 to 2002 and the Secretary in General of WCD1992 in New York. National flag of Taiwan was flying during the WCD meeting. Steve invited Prof. Hsin-Su Yu, who was the President of Kaohsiung Medical University, to deliver scientific talks in NIH a couple of times. Since 2004, I have participated in almost every annual meeting of SID (such as 2008 IID, [Figure 2]). Many times in the meeting when I met him, Steve was always energetic, passionate, and full of joy. One time after AAD meeting in New Orleans, my wife Kathy, our little daughter Madison, and I met Steve and his wife Linda in Washington DC. It was an academic and social refreshment, and I am still deeply influenced by his mentoring, positive attitude, but critical thinking. The balance between patient care, scientific merit, health, and family relationship is what matters the most in life. Steve nourishes our knowledge and harvests our scientific perspective. He strives to cultivate young people and establishes the academic paradigm and he himself featured as a distinguished role model for physician scientist and physician educator. The TDA always remembers him for what he has done and helped for scientists, physicians, their families, and the society. With this memoriam, TDA and Taiwanese Society for Investigative Dermatology honor Steve with heart of hearts. We will be all missing you, your laughter, inspirational speech, sense of humor, and humane generosities.